Let me state the obvious. Hearing aids are expensive. Learning that Medicare and other insurers do not pay for hearing aids is frustrating. Why is age-related hearing loss not considered a medical condition? It is important for having an enjoyable and livable daily life, as well as in terms of senior home safety. Hearing the smoke detector or the telephone can save lives. However, many seniors cannot afford to pay for a hearing aid and try personal sound amplifiers instead. Here are some more affordable, low-cost, and cheap hearing aid alternatives to help you hear better. There are many devices on the market today to help seniors with hearing better. Personal Sound Amplification Products (PSAP’s) are helping many seniors and elderly at the fraction of the price of a traditional hearing aid. Some of these devices are worn on the ear like a hearing aid, while others have an external box that goes inside a pocket or purse. Often PSAP’s like these help seniors get through the early days of hearing loss. Some seniors rely on these because they cannot afford the high costs of hearing aids. Using an alternative to a hearing aid helps them get by. It also gives them time to save up, or find another way to pay, for a traditional hearing aid. For profound hearing loss, a hearing aid may be the only way to go. Unfortunately, there are a lot of BAD cheap hearing aid alternatives out there. Many do not live up to their promises, and others do not work at all., while some should be avoided at all costs. This is one area where price will be somewhat an indicator of quality. Consumer Reports recommends avoiding all hearing amplifiers under $50.00. But, how do you know which hearing aid alternatives are worth buying? I’ve done all the research for you, Read on to learn about some of the best cheap hearing aids! Not a discreet hearing aid alternative but very effective and works incredibly well. Lots of features and sound levels can be adjusted through an app. Best overall hearing aid alternative with multiple configurations. Very small and very light. This was a hard category to research. There is a lot of junk out there in the under $100 category, as many inexpensive hearing aids aren’t great quality. 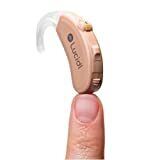 But, the Lucid Enrich hearing aid alternative is a little gold nugget among the junk. You probably have never heard of Lucid Audio, since they’re more popular for high-end sound boosting headphones and earbuds. They’ve figured out a way to use the technology from those products to help people with hearing difficulty. 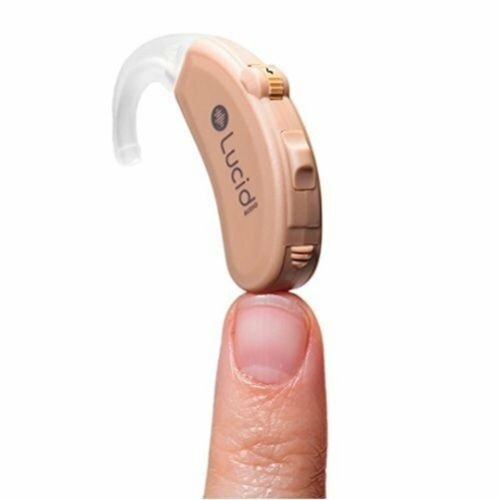 This Lucid Enrich is a great choice, especially for those who are looking for a cheap hearing aid alternative. I’d recommend it for those who are just beginning to think about hearing aids or are experiencing early stages of hearing loss. Remember though, this is a cheap hearing amplifier, not a hearing aid. It’s an alternative hearing aid / PSAP that costs less than $100.00, so set your expectations accordingly. 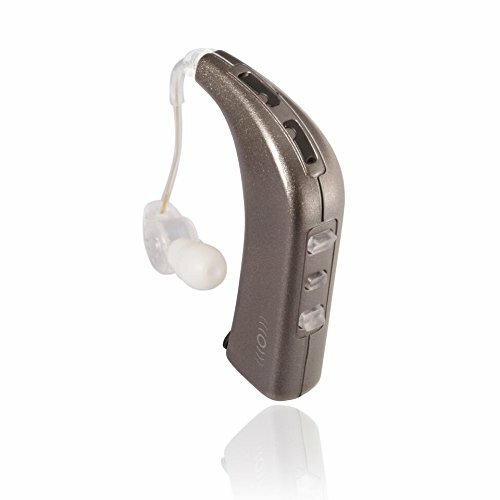 The 3 sound modes offered by the Enrich are not found in many other hearing aid alternatives, especially in this price range. These modes adjust the sound amplification based on the environment the user is in. The first mode is everyday use. For example, watching TV, listening to a speaker, or going for a walk. The second mode is for high-frequency sounds, and a third mode is best for low-frequency sound environments. This improves overall hearing and allows the user some control over what they hear. There is no power switch – you have to take the battery out when not using it. The Williams Sound PockeTalker is a different style of hearing amplifier. Rather than being worn in the ear, it is essentially a microphone, an amplifier, and headphones that sits on a table or in your pocket. The microphone picks up the sound around you, amplifies it, and sends it to the user through the headphones for you to listen. It’s a great cheap hearing amplifier. Because it works with a microphone and doesn’t have to stay in the ear, it is easy to move it closer to the sound the user is trying to hear. For example, it comes with a longer cord so that the microphone can be placed closer to the TV. This really helps with TV volume, especially for family and friends who don’t like the TV being so loud all the time. Another good use for this style of alternative cheap hearing aids for seniors is for small gatherings. Placing the receiver closer to the conversation allows the user to hear better. They will feel more included and not have to ask others to repeat themselves as often. A device like this also benefits existing hearing aid users. Many hearing aid wearers complain about not being able to hear people up close. Because this device can be used with or without traditional hearing aids, this device solves that problem. The user has a choice of headphones too. This set comes with both a full set of headphones and an earbud. That way, the user can choose the best one for the situation they’re in. There is nothing at all discreet though with the PockeTalker. So, it’s probably not a good choice for people who are sensitive about letting others know about their hearing loss. But for those who don’t care that others see the device, this will improve their hearing, especially in up-close interactions. Overall, the PockeTalker Ultra is the best cheap hearing aids alternative for up close interactions and TV watching. Most of the benefits of using this product come from the ability to move it closer to the source of the sound, although this makes it much less discreet to use. My runner-up for the best hearing aid alternative is the Sidekick Personal Sound Amplifier from Sound World Solutions. This is another hearing device offers some very unique features found only in traditional hearing aids that cost thousands of dollars. The Sidekick uses Bluetooth to accomplish some pretty cool things. First, the device is completely customizable through a Bluetooth app. Downloading the app to your favorite mobile device gives the ability to customize the settings and tweak it to suit the wearer. If the senior is tech-friendly, it is easy to train them to do this themselves. Because it is Bluetooth enabled, this PSAP also plays music, audiobooks, podcasts and more right through the earpiece. Simply sync the amplifier up to a Bluetooth enabled device and the senior can listen to their favorite entertainment. Restaurant mode filters out background noise like in restaurants or large social gatherings. This alternative to traditional hearing aids is more discreet than some of the others, most notably from the front. The largest part of the unit sits behind the ear and is connected to the ear by a clear tube. Seniors with longer hair behind the ears will be able to hide most of this unit from view. The Sidekick’s battery is rechargeable and last about 18 hours a day – great for all day wearers. Takes about 2 hours to recharge fully. Rather than annoying beeps, it uses voice prompts to confirm actions and guide the user through setting changes. 4 languages are available. 3 Preprogrammed sound modes for different environments. The Sidekick offers some of the benefits of standard hearing aids that cost thousands such as Bluetooth capabilities and other unique features. The Sidekick is not a cheap hearing aid alternative though, and does cost more than the others above. The Otofonix personal sound amplifier is by far the best of the hearing aid alternatives in my research because it is small and discreet, offers settings to tweak the sound amplification for the user, and the company offer live tech support on the phone. This is one of the best features of this device. Otofonix has trained technicians that are only a phone call away to answer questions or walk you through settings and setup. It offers 10 different volume levels as well. This hearing aid alternative is very small, since it is only 0.5″ x 0.3″ x 1″ long. It only weighs 0.2 oz so it is extremely lightweight. It comes with multiple ear tips and tubes to give a more custom fit. However, it does not fit both ears and must be ordered in right ear or left ear configuration. Not a major issue but must be ordered for the right or left side. 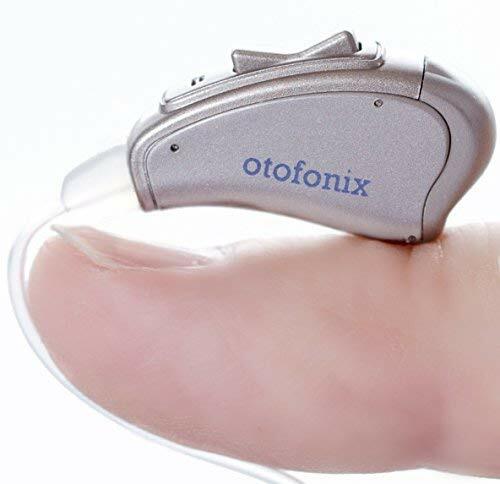 Even though the Sidekick above has a few more features, I am recommending the Otofonix as the best, mainly because it as 10 times as many reviews online and has a 4.5-star rating. Some people are leery to buy devices like this online. But, the exceptional reviews and 30-day money-back guarantee make trying this one much less risky. Images, Ratings, & Prices from Amazon Product Advertising API - Updated on 2019-04-22 at 15:35 - contains affiliate links (see footer). Unfortunately, it’s very difficult to find inexpensive hearing aids. Luckily, there are many alternative options that can enhance your listening experience as you get older, specially for people with low hearing loss or who just need a little boost to hear their favorite music or TV program. More affordable, alternatives cheap hearing aids for seniors like Personal Sound Amplification Products (PSAP) can bridge the gap. But remember that eventually, a more traditional hearing aid might be required. Review your concerns with your doctor or audiologist. So, do you have any experience with either hearing aids or hearing amplifiers like the products above? Advice, questions, and even disagreements are always welcome here, so leave a comment below! Also please share this information with friends and family on your social profiles if you found this article helpful! I appreciate the obvious research you have done. The only item not discussed is with ordinary conversation with living persons. My husband wears an expensive hearing aid and I am a normal hearing partner. However, we have a very difficult time with ordinary conversation. I either have to raise my voice and sound like a shrew or repeat every word. I have tried to speak his name to gain his attention and even then must repeat. This does not permit a conversation but rather a distraction. Please some encouragement in your reviews of each of these alternatives. I may be deaf soon, due to volumes I use or must put up with from outside sources. thank you .